Air India is set to introduce a flight from Amritsar and Delhi to Birmingham on four days a week from August 1, 2013. This will be the fourth Air India flight to UK from India. Earlier in June this year, Air India had introduced its B-787 Dreamliner services to London, which was the third flight to the city from India. 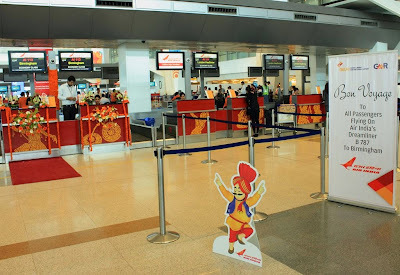 Air India is offering attractive inaugural fares on the Delhi-Birmingham-Delhi sector for a limited period with a free add on sector from Delhi to Ahmedabad, Kochi, Thiruvananthapuram and Kozhikode. The new flight introduced by Air India will operate on the Amritsar-Delhi-Birmingham-Delhi-Amritsar route with the state-of-the-art Dreamliner aircraft on Mondays, Tuesdays, Thursdays and Saturdays. The flight from Amritsar will leave at 1030 hrs, reach Delhi at 1150 hrs. AI-113 will depart from Delhi at 1330 hrs and reach Birmingham at 1800 hrs. The return flight AI-114 will take off from Birmingham at 2130 hrs and reach Delhi the next day at 1005 hrs. The flight for Amritsar will leave Delhi at 1205 hrs and arrive in Amritsar at 1305 hrs. Air India's direct flight from Delhi to Birmingham will not only fulfill the needs of the ethnic community to fly to India direct but also help to develop better tourism and trade relations in general. Air India at present operates 21 flights to London per week, seven on the Mumbai-London-sector, and 14 on the Delhi-London sector. I think they are due to use a 787 for this too?